Chris Post and Ryan Chani present this monthly showcase featuring talented comedians inside one of Cambridge’s most unique venues, Gallery 263. 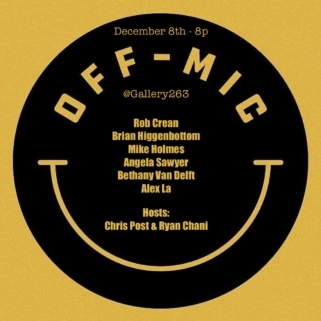 “Off-Mic!” refers to the fact that Gallery 263 is so intimate, amplification is often totally unnecessary. Without a microphone, the barrier between performer and audience is knocked down. Off-Mic! gives audience members a behind-the-scenes look at the creative process of performing. TICKETS: $10 suggested donation at the door. Doors at 7:30 PM. Show at 8:00 PM. This month’s charity is TBD.